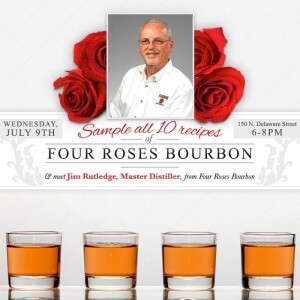 So here’s where I’ll be Wednesday evening — tasting bourbon at Crown Liquors, 150 N. Delaware St., during a meet and greet from 6 p.m. to 8 p.m. July 9 with Four Roses master distiller Jim Rutledge. You can sample all 10 Four Roses Bourbon recipes at barrel strength from Private Barrel Selections that were hand selected by Crown Liquors and Rutledge. Bottles will be available for sale during the event of each of the ten barrels selected for $49.95 each. According to a recent release from Crown Liquors, this is the first time in Indiana that all 10 Four Roses Bourbon recipes will be available to purchase at one time. Crown Liquors has been selecting barrel strength barrels from Four Roses Bourbon for the past two years and recently had one of their Four Roses Private Barrels selected as the best single barrel bourbon and the best bourbon overall — and was a double gold medal winner — at the 2014 San Francisco World Spirits Competition. The Crown Liquors “5 Star Whiskey Panel” consists of Ben Pearson (Avon store manager and whiskey expert), Brennan Corder (director of beverage education and training), Andrew Yanke (Downtown store manager), Ian Dinius (106th Street and Michigan Road store manager) and Will Moore (chain general manager).